Portuguese is among the most desirable languages of the world. Currently, the language is spoken by an estimated 250 million people all over the world. However, a majority of these people are native speakers of the foreign tongue. As you learn Portuguese you will discover that it can be fun, engaging, and romantic. In addition, you will also establish why to learn Portuguese is generally important for every individual in the world. The Portuguese language has Western Romance roots and it can further be categorized in the Indo-European family. Other Romance languages include Italian, Romanian, and French. These foreign tongues are categorized here due to the fact that they emanated from the Latin language. This was the language which was used by the western Romans in their empire. The Spanish language is very similar to Portuguese. Therefore, Spanish speakers can easily comprehend the language. However, it originated from the Iberian Peninsula. The language is written in the Latin system by using the Portuguese alphabet. Brazilian Portuguese: The Portuguese colonized Brazil and therefore, that is why the language is still spoken in the South American country. Baiano: It has a rhythm based syllable aspect. Costa Norte/ Cearense: Has several ancient Portuguese words and a heavy emphasis on the tongue. Caipira: This dialect exists mostly in the rural areas of northern Parana, and Sao Paulo among other areas. Gaucho: Heavily influenced by the Spanish language. Amazofania/Nortista: Mostly spoken in the Amazon Basin in areas such as Manaus and Belem. Carioca/Fulminense: Spoken mostly in Minas Gerias, Rio de Janeiro, and Espirito Santo. Mineiro: also spoken mostly in Minas Gerais. Nordestino: can be divided further into Piaui from the south and Maranhao from the north. Serra Amazonica: The most recent dialect. It has distinctive accents from migrants. Paulistano: spoken in Sao Paulo. Sertanejo: spoken in Rondonia and Tocantins. Florianopolitano: spoken in Florianopolis and it has a great European influence. Sulista: spoken in Curitiba, southern Brazil, and the Rio Grande do Sul. The nations which speak Portuguese are known as Lusophone countries. Portuguese is the official language of various countries which include Cape Verde, Macau, Guinea-Bissau, Sao Tome and Principe, Brazil, Angola, Equatorial Guinea, Portugal, East Timor, and Mozambique. In addition to this, the Portuguese language was also termed as an official language in the Goa area in India. However, this lasted until 1961, when the area got independence from Portugal. Although the language is still spoken in the area, it is only the elderly and the educated who can comprehend it effectively. Regardless of this, Portuguese speakers can also be found in other areas of India such as Diu and Daman. Moreover, it is also spoken in Sri Lanka’s Batticaloa area, Caribbean’s ABC islands, in Malaysia’s Malacca state, and in Indonesia’s Flores Island. The Portuguese language is also taught as a foreign tongue in the school curriculum of countries such as Senegal, South Africa, Uruguay, Zambia, Swaziland, Venezuela, The Congo, and Namibia. When you delve deeper into studying Portuguese, you will discover some of the most interesting facts about the foreign tongue. In addition, learning the Portuguese language is simpler for the native English individual. However, the Portuguese accent has a notable American English pronunciation aspect. Although the structuring of the sentences and the grammar differ with English, the language is much simpler when you compare it to other foreign tongues. There’s a group of people who think that it’s easy to learn a new language. However, they don’t know that it is a process that requires hard work and dedication. Here are a few tips that will enlighten you more on how you can study the Portuguese language. Consider subscribing to the concerned YouTube channels if you are thinking of studying Portuguese online. One of the reasons that make YouTube interesting is that it provides you with a wide variety of materials that you can choose from. As a result, when you sample the different YouTube videos, you will establish why to learn Portuguese can be interesting. Among the various YouTube channels that you can subscribe to include; Hello Rusty, Street Smart Brazil, Professor Jason. 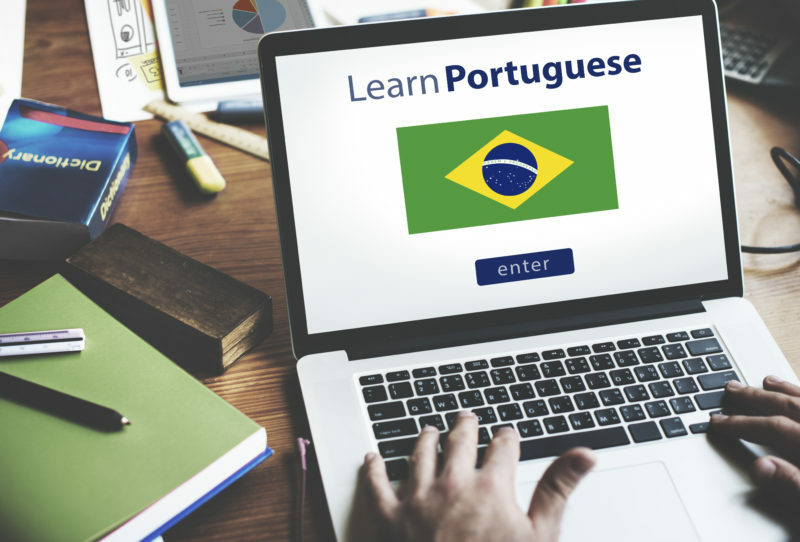 These YouTube channels will provide you with an opportunity to learn grammar, pronunciation, and common mistakes people make while learning the Portuguese language. Moreover, they will also give you a chance to learn simple sentences before you can move on to intermediate or complex sentences. Quite a number of people love Portuguese music because of its richness and variety of genres. You can find Jazz music, Rock, Samba, Bossa and Nova among others. If you hope to learn the Portuguese language competitively, strive to listen to the lyrics so that you can improve your oral comprehension, discern new vocabulary, and improve your pronunciation. A huge majority of people who are looking to learn a new language often go for phrases. However, sometimes that is not enough as you need to make up whole sentences. In addition to this, as much as you learn a new word, look for ways to implement it in a sentence. Furthermore, consider downloading various beneficial apps such as the Mosalingua app that will offer you valuable lessons, especially on a selection of phrases that can be useful for you when you’re learning the Portuguese language. Additionally, you can also download the Brazilian Portuguese Conversation Guide that will assist you in formulating whole sentences. Moreover, you can also purchase an English, Portuguese dictionary which will aid you in discovering new words and ascertaining the context of using them. Online resources like babble.com can also be valuable as an aid for learning Portuguese. The Chrome Extension is not popularly known as a competent language aid. However, it can facilitate your learning of the Portuguese language. Furthermore, it is also faster and quicker, therefore, you will learn the language promptly. Consequently, if you are hoping to learn new vocabularies, then opt for this novel method. However, its usage will depend on the settings of your chrome. Locate it by searching for the language immersion for chrome on your settings. This extension will help you to practice your Portuguese language knowledge in a simpler way. One of the interesting methods of learning the Portuguese language is to watch movies that have been acted in the foreign tongue. The advantage of doing this is that you learn how words are pronounced and you can practice them promptly. Ensure that the movies have subtitles so that you can understand what they’re talking about. Some of the best movies that you can look out for include; City of gold (Cidade de Deus), Elite Squad (Tropa de Elite), Central Station (Central do Brasil), And Father’s Chair (A Busca) among others. How Can I learn to Speak Portuguese Quickly?